Keep it street but keep it stylish when you step out in a pair of women’s fashion sneakers. If you weren’t born to run, but want to bring the cool wherever you go, these cheap women’s sneakers are made to help you look the part without busting your bank. 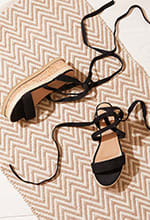 Offering you a sporty catwalk alternative sneakers are the perfect piece of footwear to accompany your travel outfit, or for wearing with hot pants and denim jackets when you want to be cool and comfy while killing it at a club or gig.